This past year, I had a new idea to expose my students to more culture and have them identify with a particular Hispanic country. I had each class “Adopt a Country” so to say. Each of my classes choose a particular country; we had a head-to-head vote until we narrowed it down to one country. Each class had one country that they would focus on for the school year. At the beginning of the year, students learned the geography of Latin America and took a quiz on labeling the map and matching the capitals. (Quiz for free here). Click the picture to read more about setting up the clocks. The next step was talking about the temperatures in those specific countries. Another goal of mine was for students to start to become more familiar with Celsius. I had a large thermometer printed so they students could compare Celsius to Fahrenheit. Click to download either thermometer below. After we went over their bellwork work in class, I would ask “¿Hay unas preguntas?” and this was their cue to ask me “¿Qué es la temperatura en ________?” It gave them good practice at asking the question and also listening to numbers. I would have the students write the temperature underneath each country and then estimate an average at the end of their bellwork worksheet. If students are using iTouch or iPads in the class you can have the students look up the weather using the weather app. During the year, you can have students complete a research project on a selected country. If you want to have the whole class research their ‘adopted’ country, it might work better as an outside of class project. If you give the students time to work in class, in order to distribute books, you might have a student pick from a stack of cards with country names on it. Then as they present to the class, the students will learn about ALL the Spanish speaking countries. We have a 6 page project with rubrics for only $5.99 if you are in need of a ready-made lesson. Another idea, is to create (or have students create) virtual tours of the country using Google Earth. Imagine taking a class field trip from your town to the top of Teotihuacan and over to El Zócalo in el D.F.all in one class period? Other ideas to incorporate specific countries might to have a “culinary day” feature specific foods from that country, read about famous people from that country, and check out their local newspapers on a weekly basis. Find a local newspaper using NewsPaperMap.com to find a national or smaller town newspaper. Create your own airline tickets for those virtual “field trips”. Leave one on each student’s desk before class begins. International Cities weather forecast for looking up those temperatures. See what important historical events took place that day in Latin America. Check out authentic images and media broken down by country compiled by @alenord. 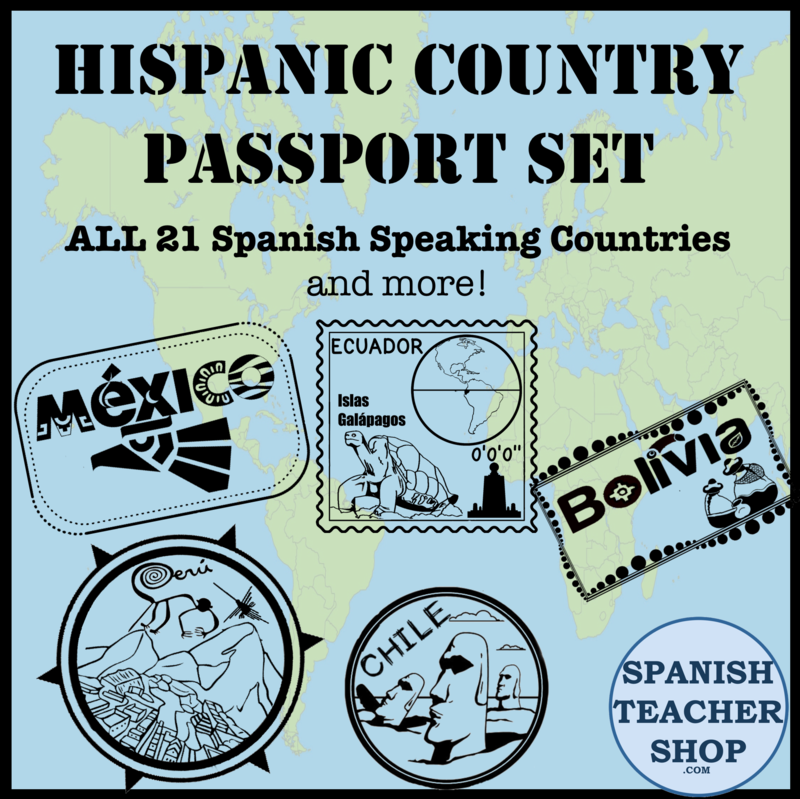 For only $1.00 purchase a set of Hispanic Countries Info Labels to display around the room. Any other ideas on bringing a country to life in your classroom? Post them in the comments section below. And if you liked this blog post, don’t forget to hit the like button below or share this using facebook or twitter. This entry was posted in Culture and tagged country, hispanic, latin america. Bookmark the permalink.